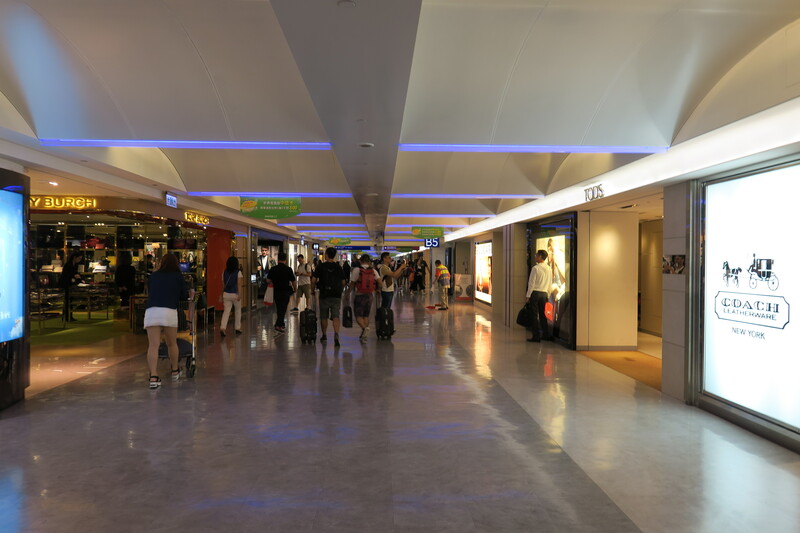 I headed towards the gate from the airport experience zone, which was a short walk. 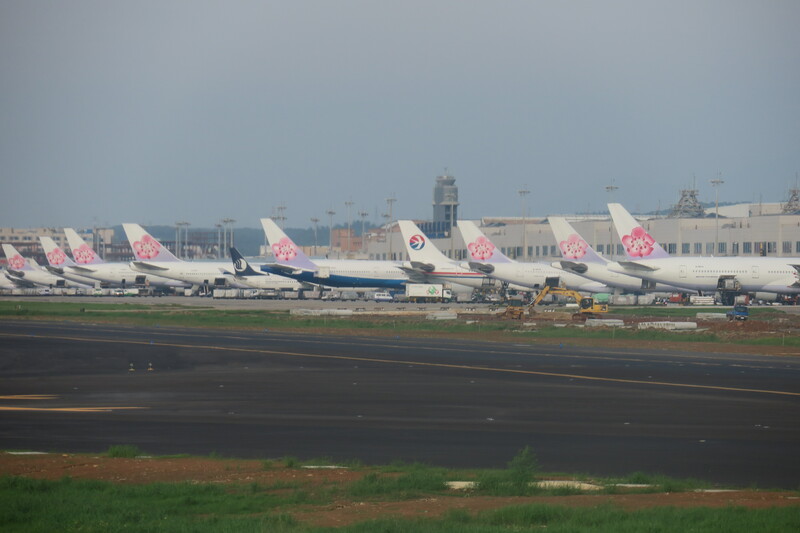 While Taipei’s airport isn’t blinged out at all (and actually feels a little run down), it is pretty colourful. 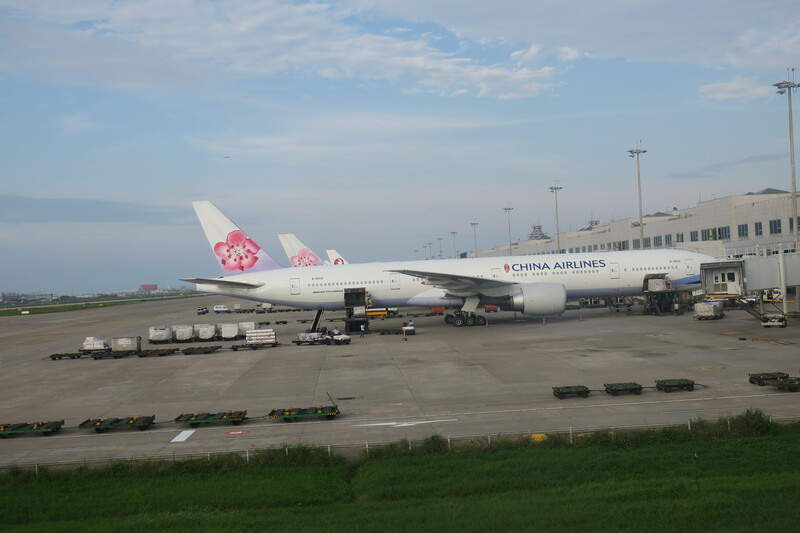 I got to gate B5, and saw the gorgeous A330 from the side window. 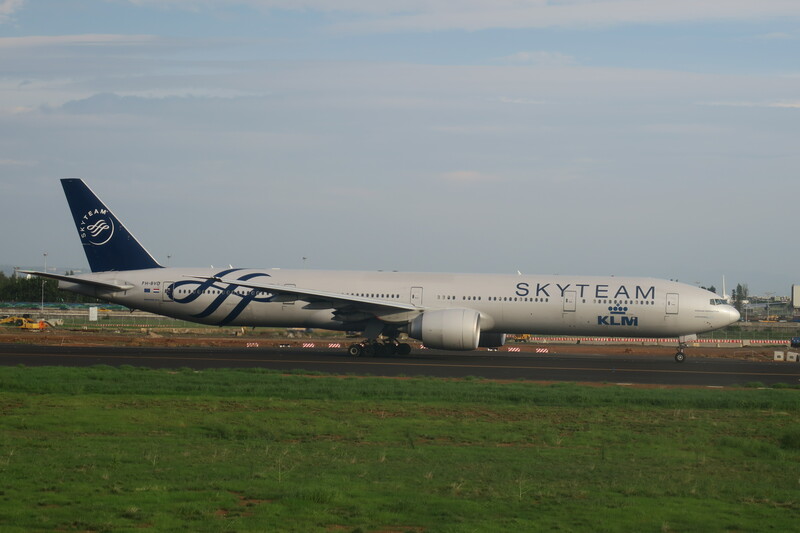 While I’ve been on plenty of Cathay Pacific’s old A330s, it was nice to know that this aircraft was less than two years old. 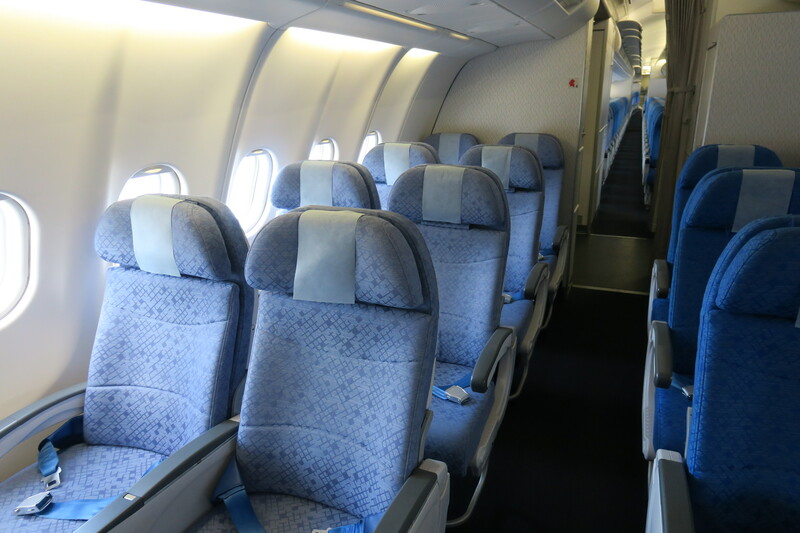 As usual I managed to be first onboard, and was looking forward to how a small cabin of 24 seats could affect our overall experience. 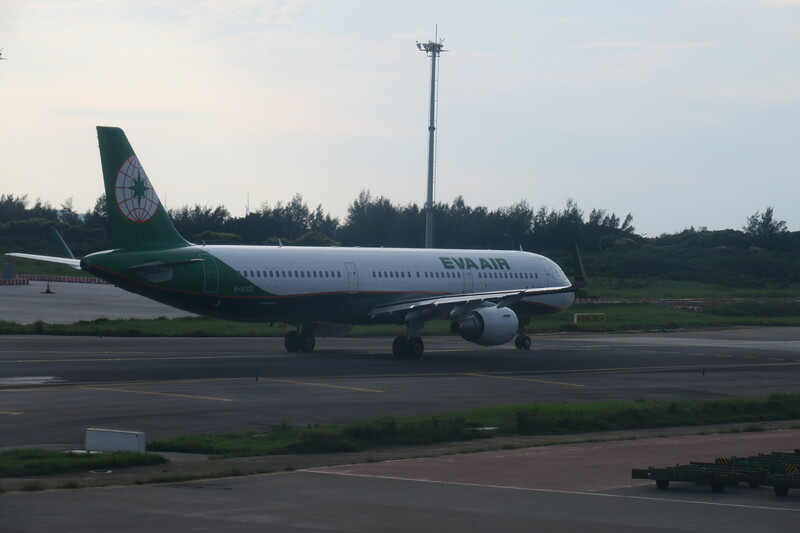 My initial reaction of the cabin was “wow, this is secluded”. 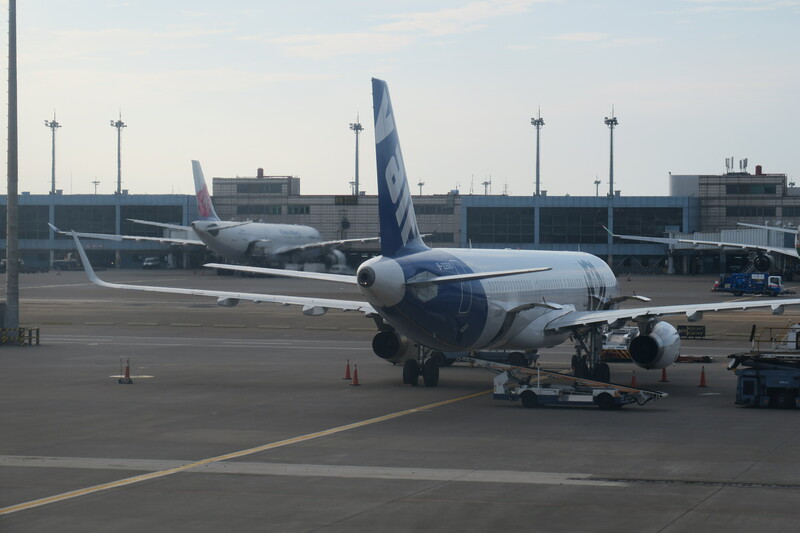 Since the aircraft still boards through two doors and we were travelling with eleven people, there were only thirteen other people we saw that we didn’t know in total. 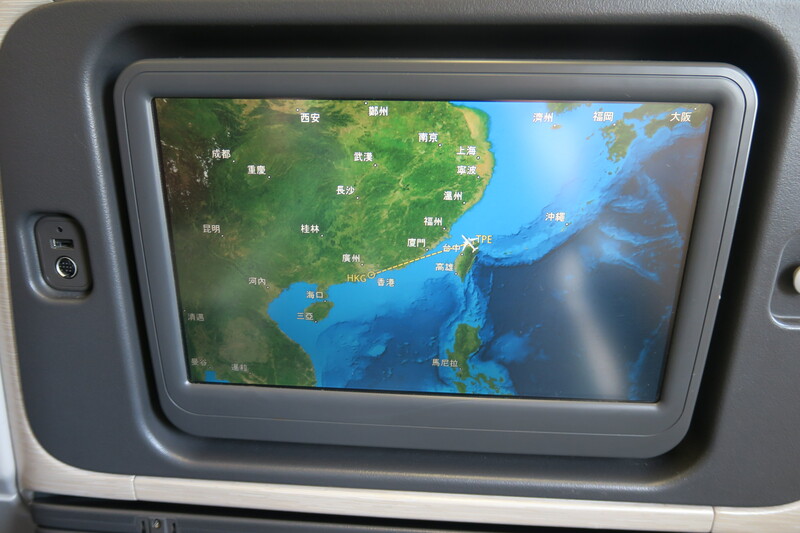 That’s pretty insane, on a flight in regional business class. 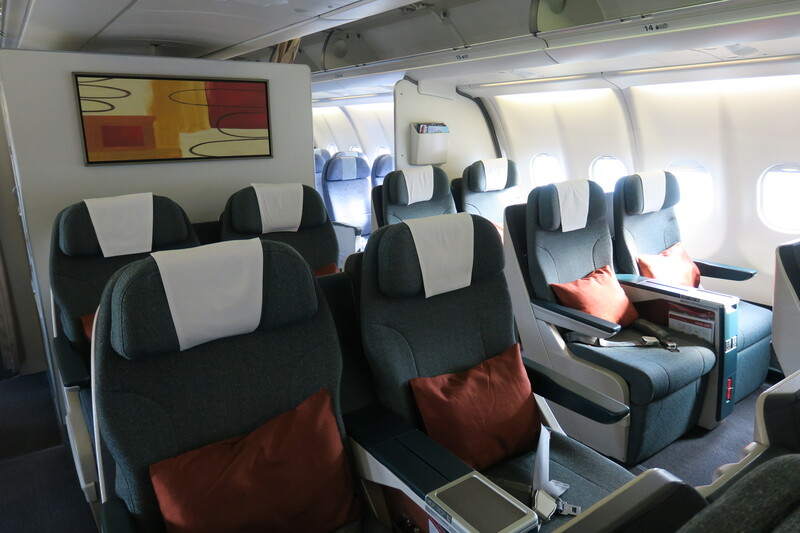 The cabin consists of 24 angled-recliner seats arranged in a 2-2-2 configuration, Cathay Pacific’s smallest-ever business class cabin. I gave ourselves seats 15D, G, H and K in the very back row, as is my preference. 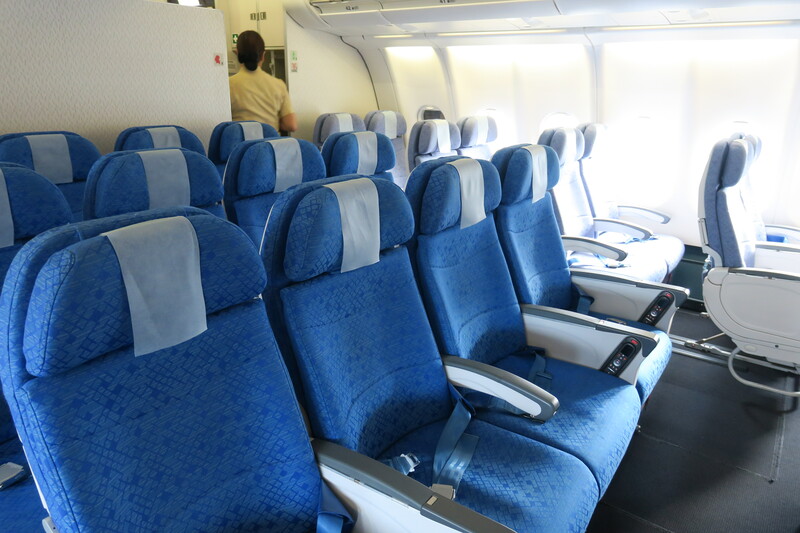 While my parents aren’t always keen on back row seats, they were the only options left when we booked the flight late, so that was what we took. 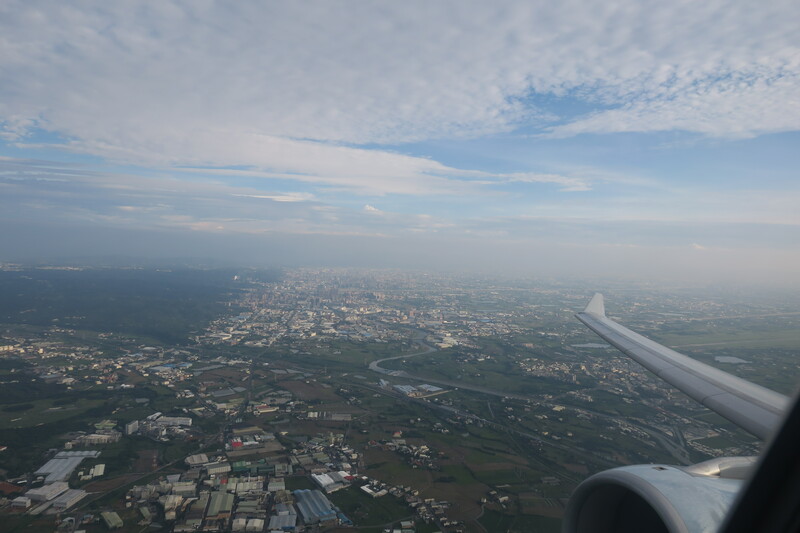 My seat was 15K, the right window seat in the last row of the business class cabin. 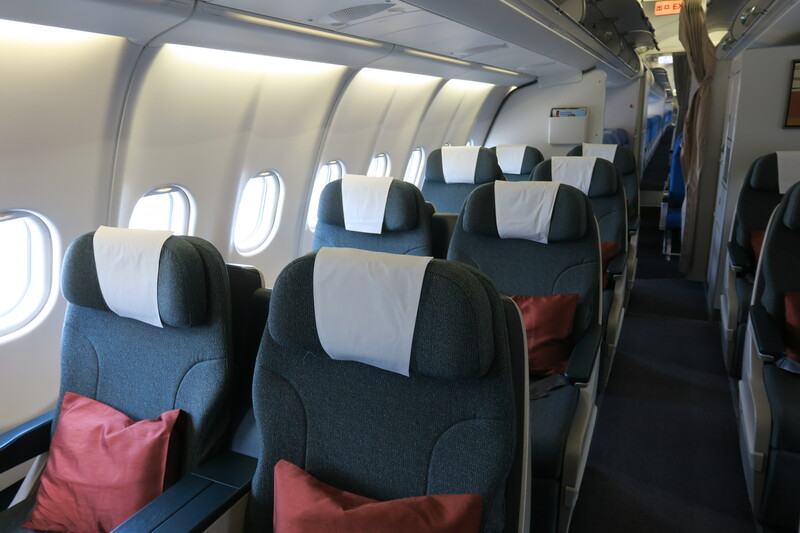 Right behind the business class cabin is a small economy class cabin up for grabs, consisting of 28 seats in a 2-4-2 configuration. While I’m pretty sure I wouldn’t be so lucky, if I could I definitely would go for these seats. 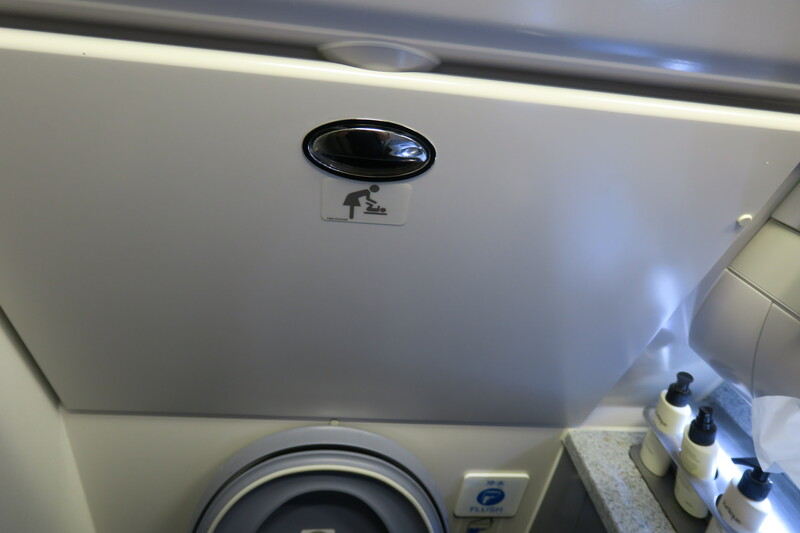 I think everyone who reads the blog on a regular basis knows that these are my absolute favourite economy seats, so I don’t think there’s much explaining I need to do. 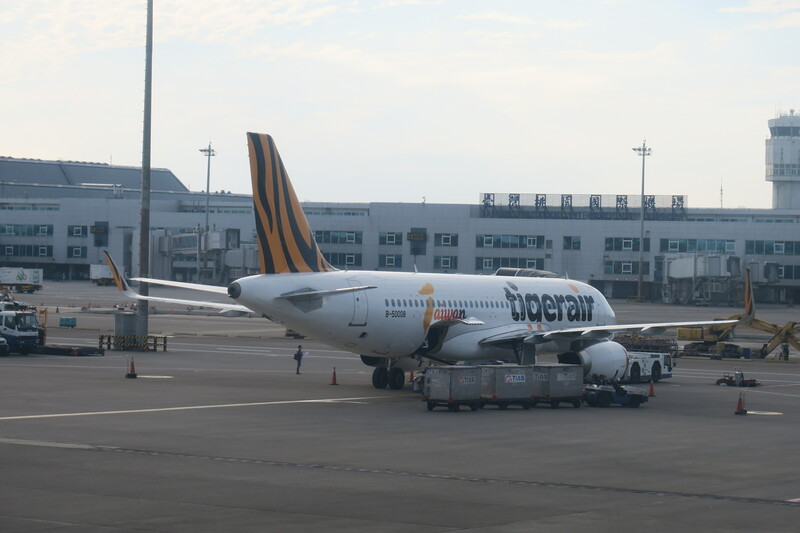 I lingered here for a while before economy class boarding began – business class got busy pretty early, so it was a pretty good place to get good pictures. 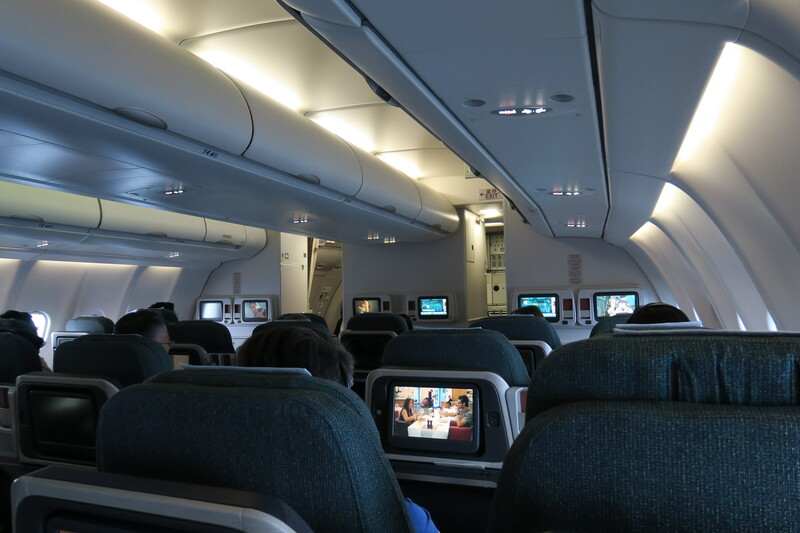 I moved back to the business class cabin and tried to grab a couple more cabin pictures before the cabin filled up. 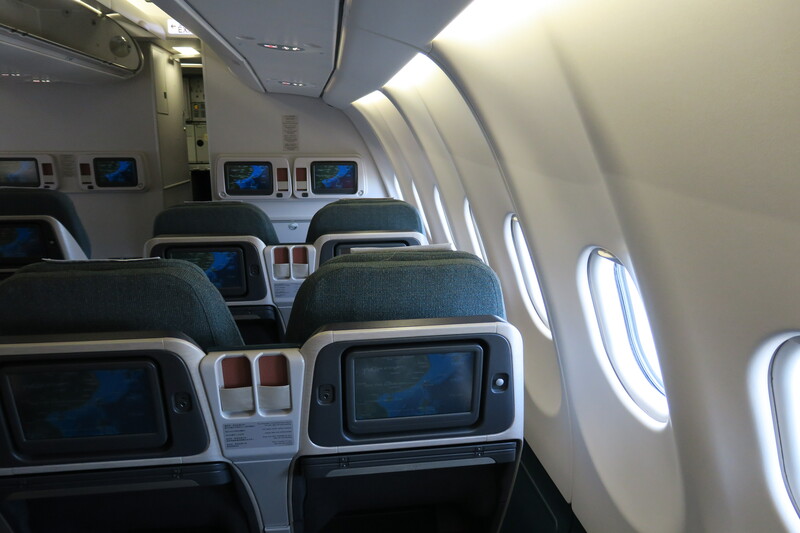 The actual business class seat was no different to any of the other regional business class seats I’ve taken on Cathay Pacific, on their 777-200 or 777-300, so feel free to check out some of those reviews for more detailed accounts about the seat itself. 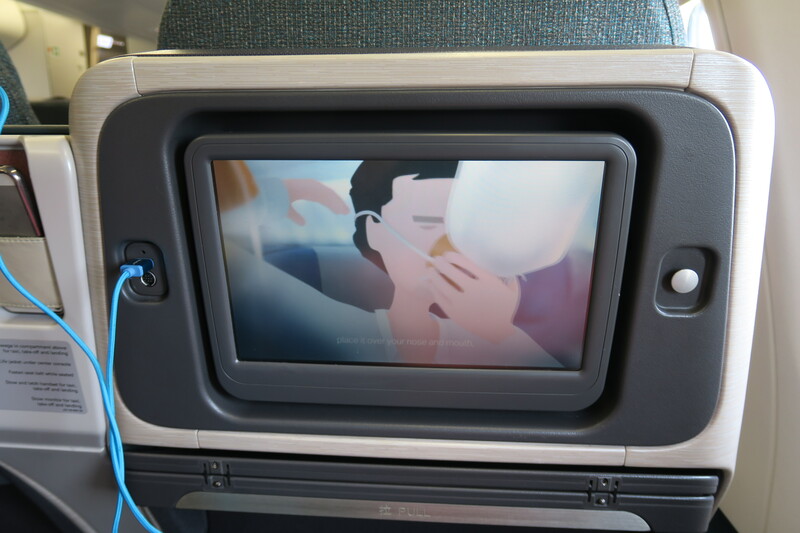 The seat features a touchscreen TV monitor, a USB charger, power ports, a few storage areas and a lot of legroom. The seat controls were located to the left of my seat though weren’t in particularly great shape for such a new aircraft. 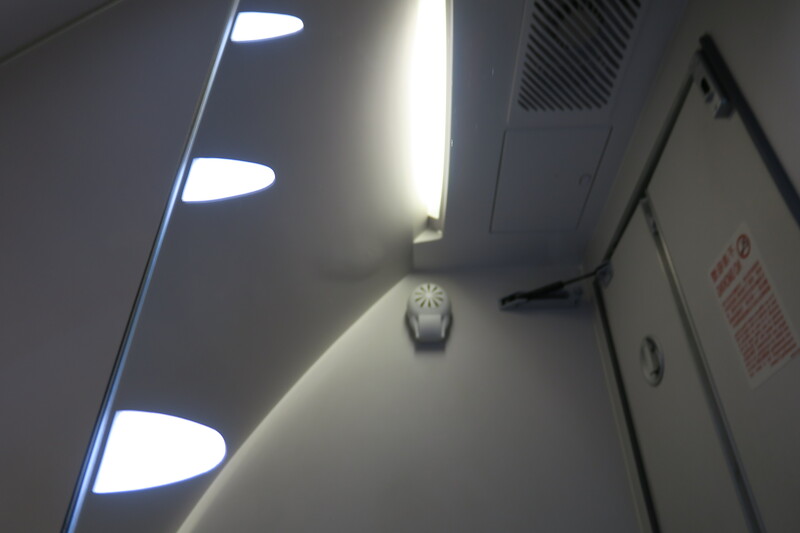 As mentioned above, the aircraft was less than two years old, so naturally featured the new Airbus interiors. It’s no secret that I love these interiors. 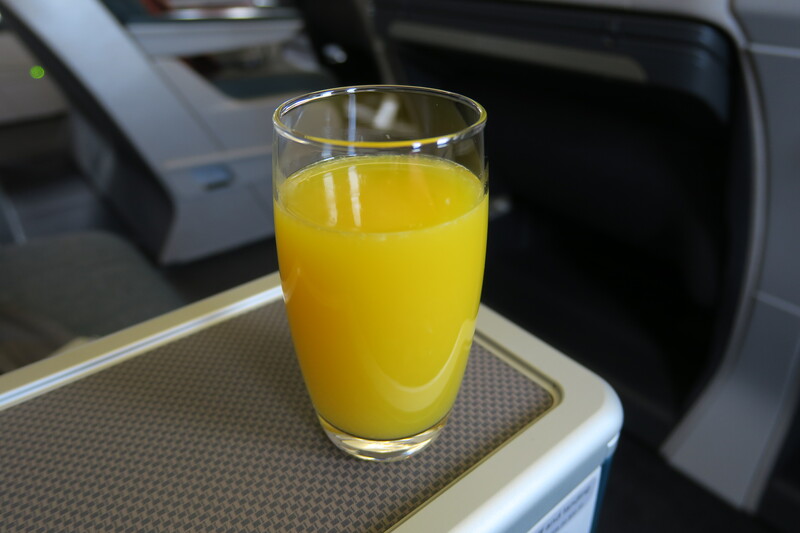 A flight attendant soon came and offered pre-departure beverages and a hot towel. I chose orange juice. The families we travelled with (all featuring pretty young brats kids) didn’t select their seats, so they got into a little conumdrum with where they were sitting. For some reason 15H ended up empty, even though it was originally assigned for my sister. They got into some issues near the front. 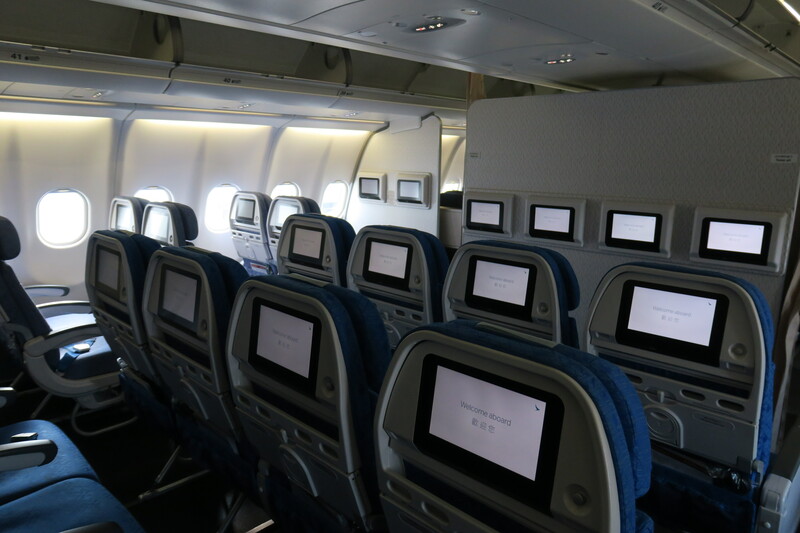 I know for a fact that this configuration is pretty stressful for most flight attendants, given that it’s completely new and also really compact, featuring only one business class galley. However, I did find it a little awkward when the purser asked to take all our boarding passes and distribute us back into our original seats. 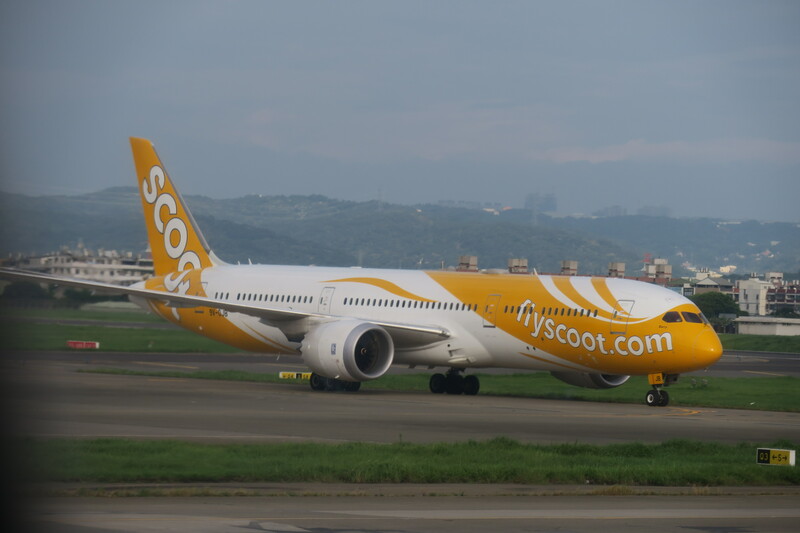 I wasn’t affected – I had picked seat 15K because I wanted seat 15K – so I just sat and put on the airshow and checked out the 777-300 next door. I had a look at the headphones. 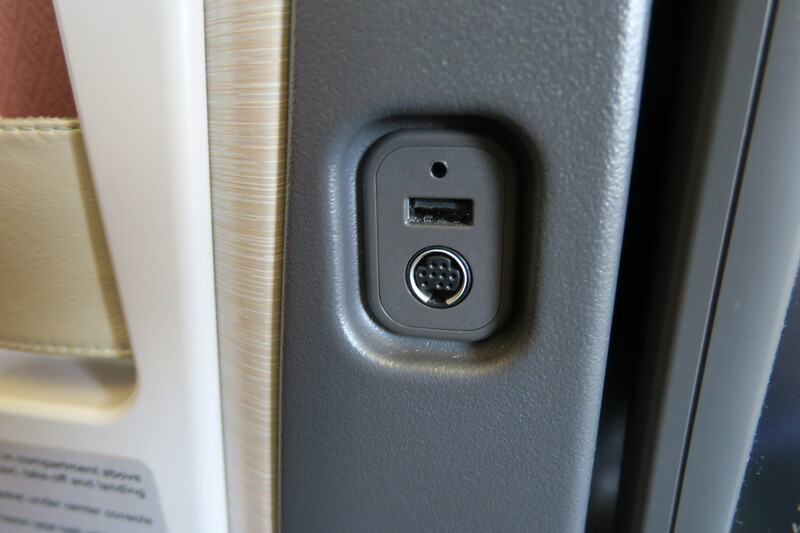 Cathay Pacific used to offer economy-style headphones in regional business class, though they seemed to have upped their game a little. 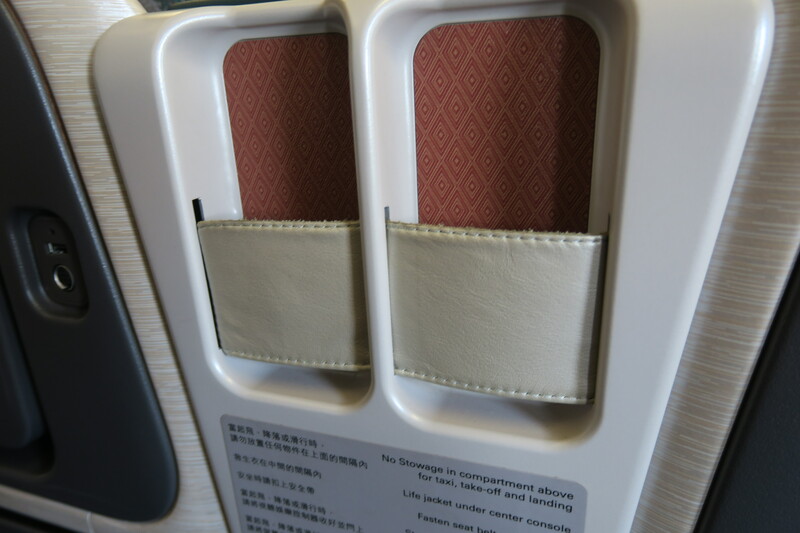 Their new headphones are more padded – still crap, but fine for a short flight. 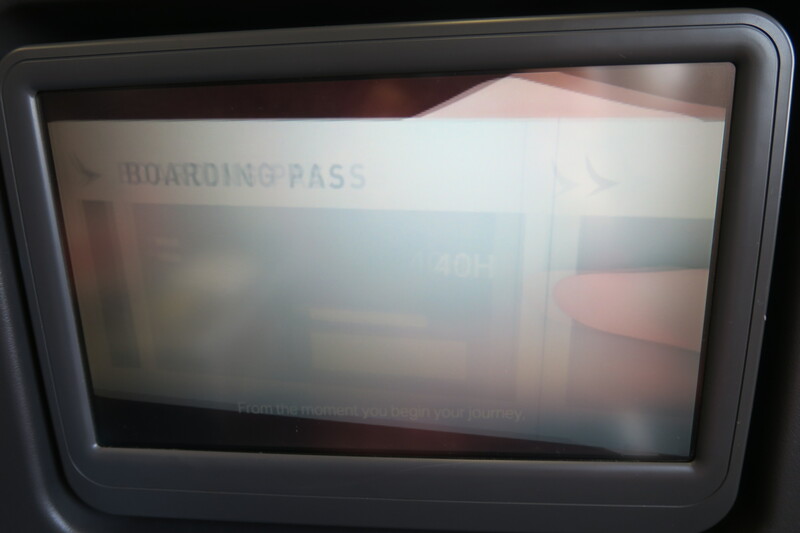 …but I guess it didn’t work out all that well, as soon they had to reboot. 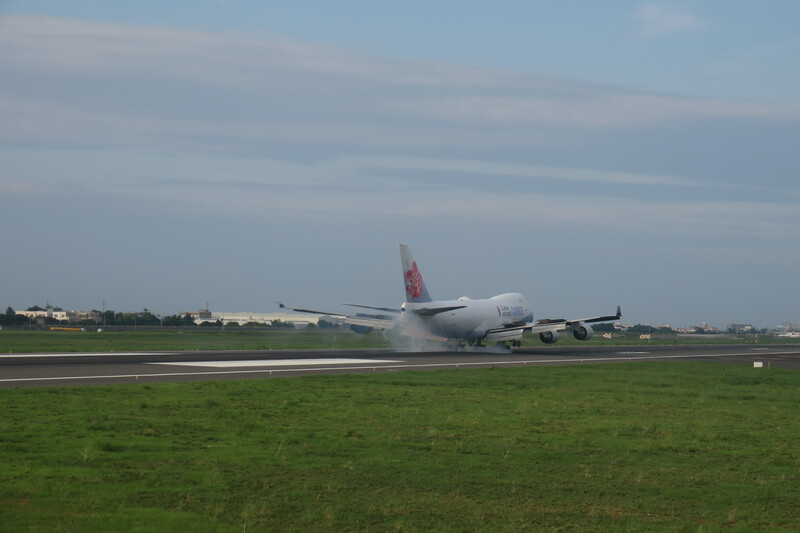 We went through a lot of interesting traffic, as we had to make our way to the other side of the terminal to perform our takeoff. 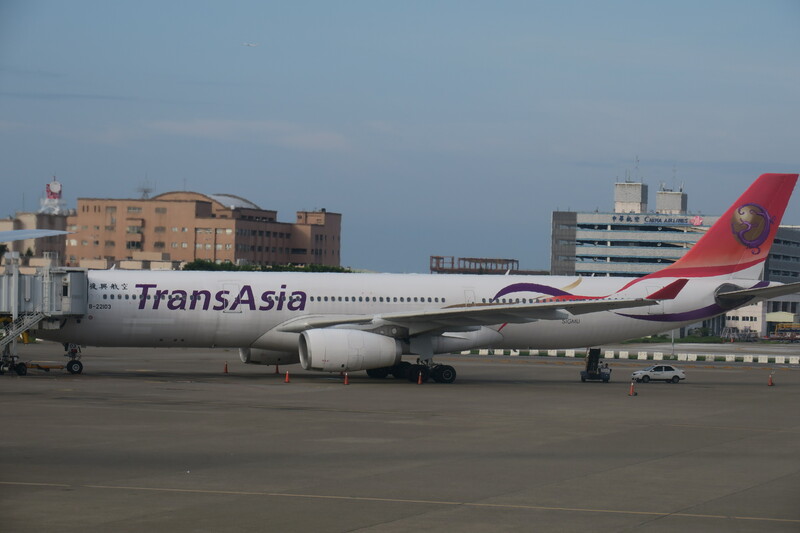 It was interesting seeing and taking pictures of different traffic at Taipei, including of defunct airlines V Air and TransAsia. 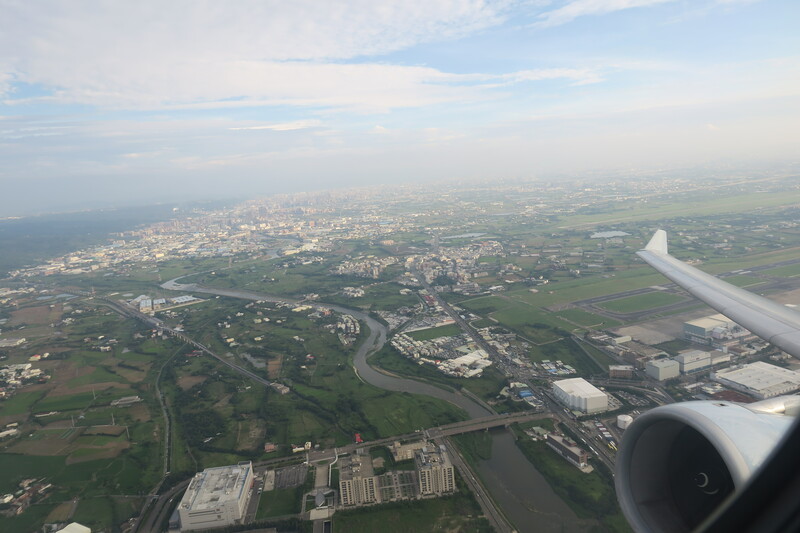 We eventually made it to runway 05R, where we had a smooth takeoff with my second departure from Taipei of the year. 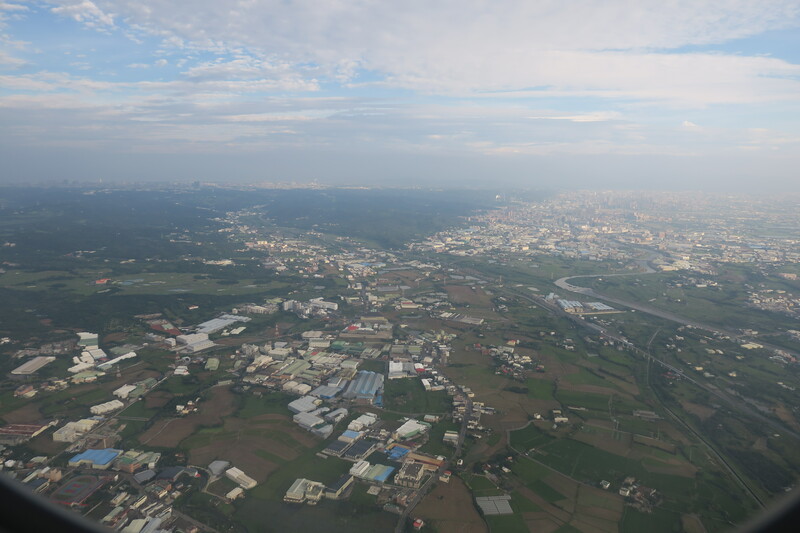 It was a fine afternoon, so I was glad to be flying in this weather. 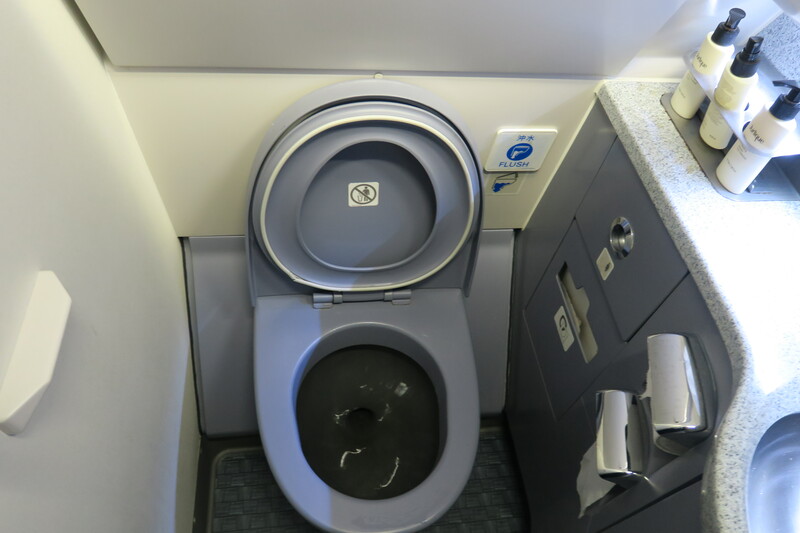 I visited the lavatory shortly after takeoff. 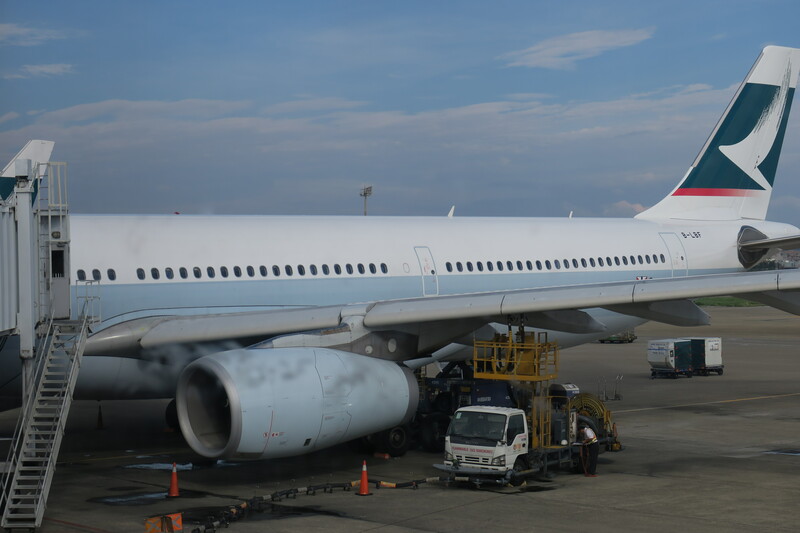 Cathay Pacific has two aircraft in the nose of the A330, which is substantial for 24 people. 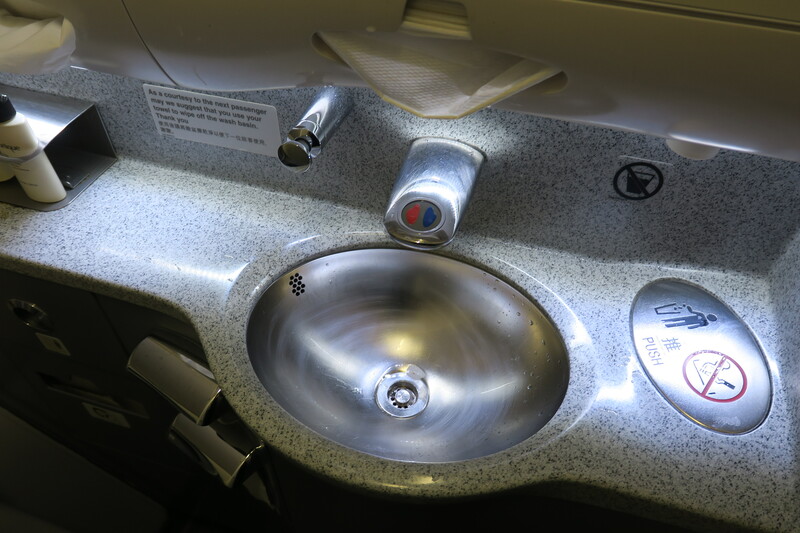 The new A330s feature different taps from the old ones, though no matter what button you press, the water it spews out is going to be hot, at least for the first few seconds. I also explored the menu. 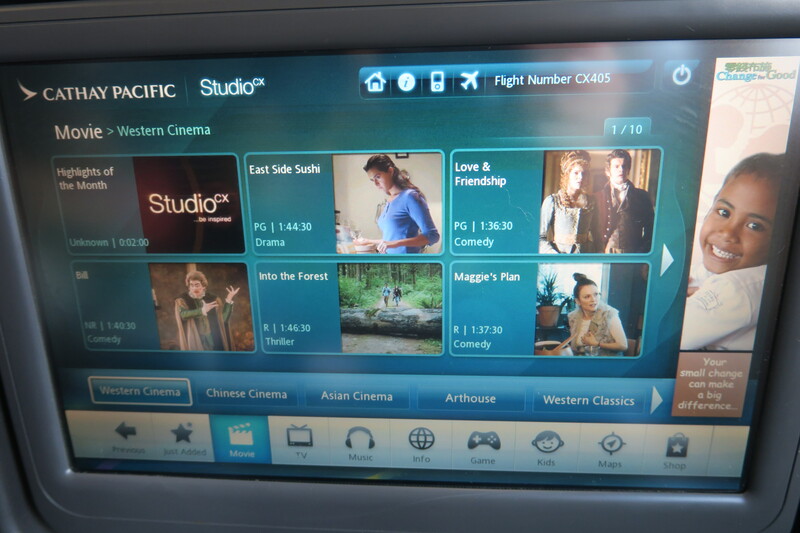 It’s nice how Cathay Pacific still offers menus in business class on short flights. 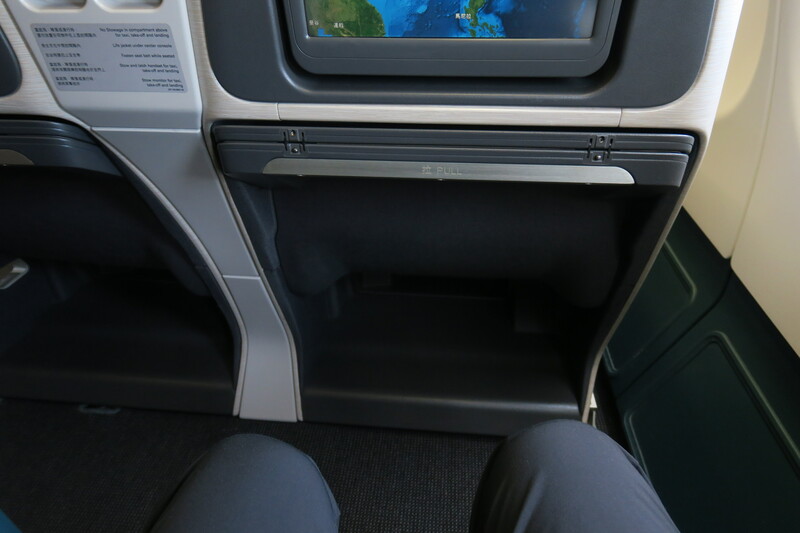 I pulled the tray table out to its full size, which is more than suitable for working, perfect for a short flight. 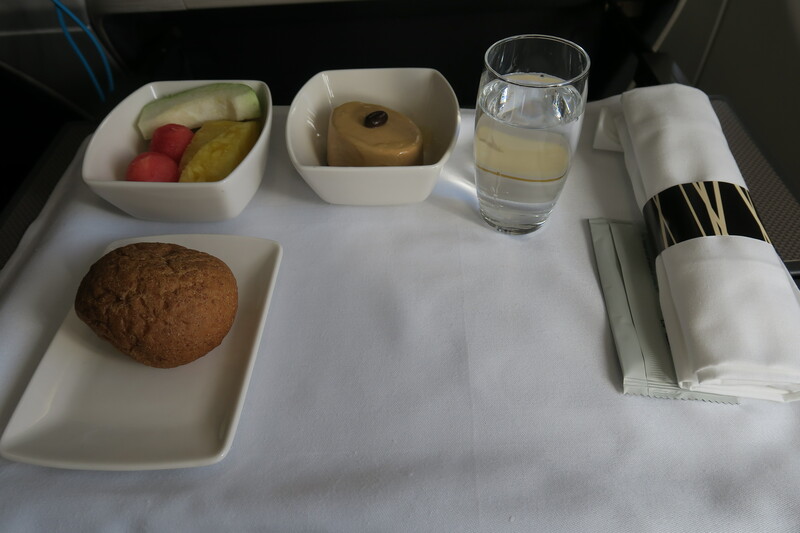 The tray table was then set up with our refreshments, which was all served on a single tray, as is the norm for short Taipei hops on Cathay Pacific. The appetiser and dessert were already on the tray, but the main course had to be rolled out on a cart. The appetiser itself was fine, though I’m not a fan of the pear-like fruit that tasted chalky, whatever that’s called. 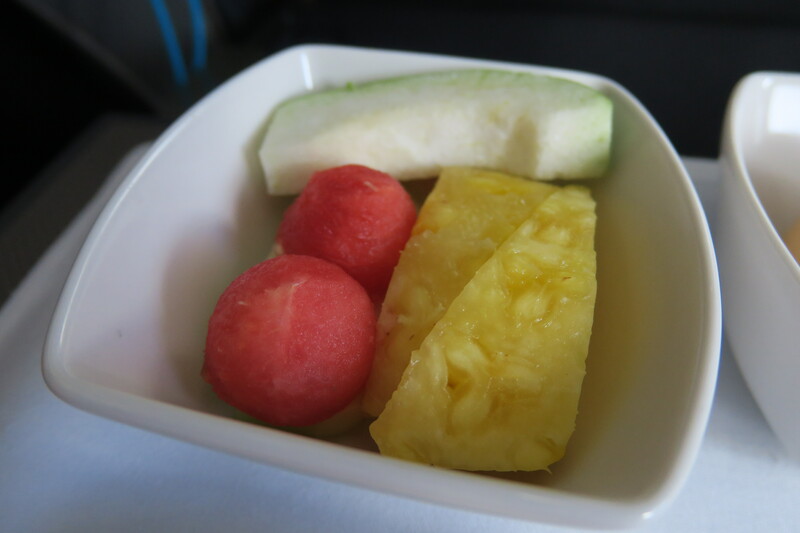 It also seems cheap to serve fruit as an appetiser in business class, though I’ll let that go on a short flight. For the main course I wanted the chicken, but unfortunately they were out of it. So I picked the fried halibut, which was probably the worst thing I’d eaten this year – while the rice was okay, the fish was confusing, mushy and the broccoli was way overcooked. The fish also had a weird aftertaste that made me call it quits halfway in. 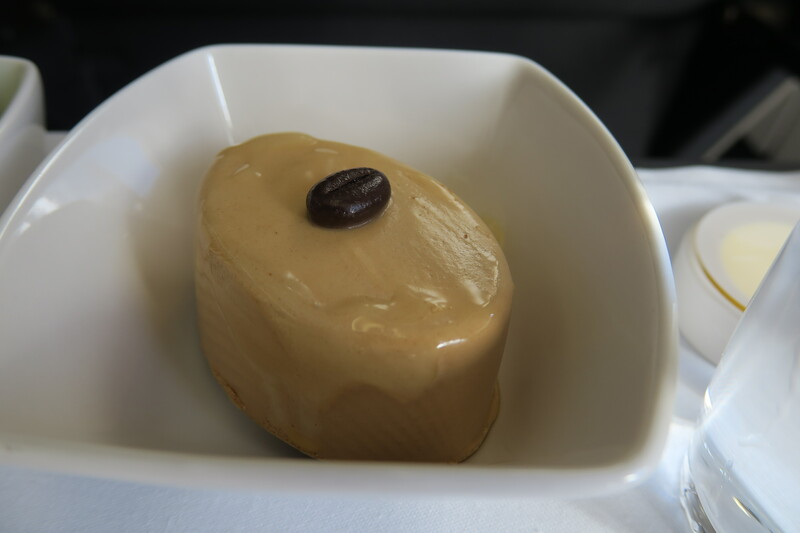 The mocha mousse dessert was good, but not great – I would’ve loved some berry compote to cut through how rich it was (and it didn’t really cleanse the palate from the terrible main course either) – there was technically pear compote on the menu, but it was indetectable. We were then passed coffee and tea, where I took a coffee (I needed to work pretty late that night, so wanted to stay energised). 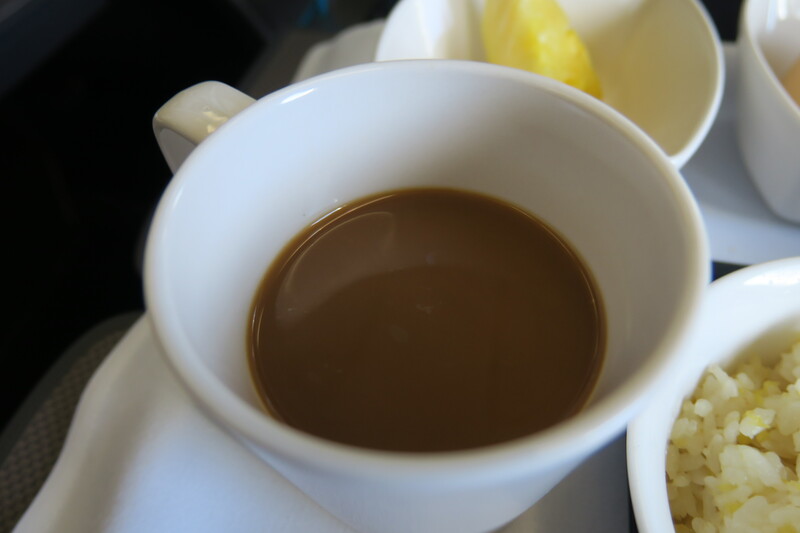 This speaks of the crew on this flight in general, which were definitely frazzled with the single galley but certainly cared about all the passengers. 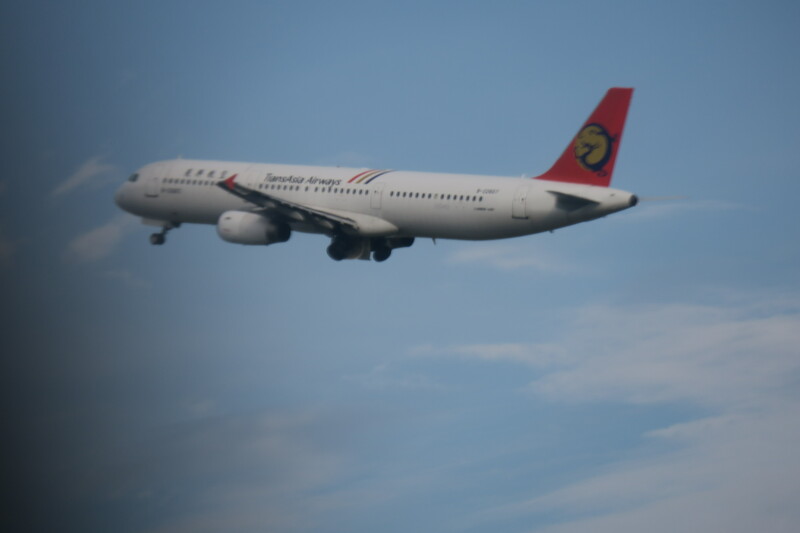 They tried their best to be friendly and personal, though that’s not really something you can pull off in a new configuration on a sub-two hour flight. I quickly scrolled through StudioCX, and was surprised to find there were (decent) movies. 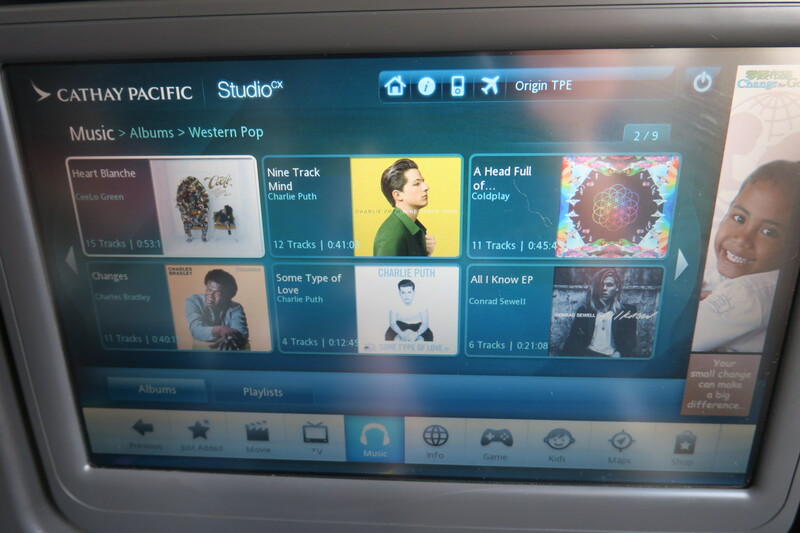 While there are many things that Cathay Pacific doesn’t excel in (just look at Jason’s rants – he writes one a day as part of his daily routine), their IFE system isn’t one of them. 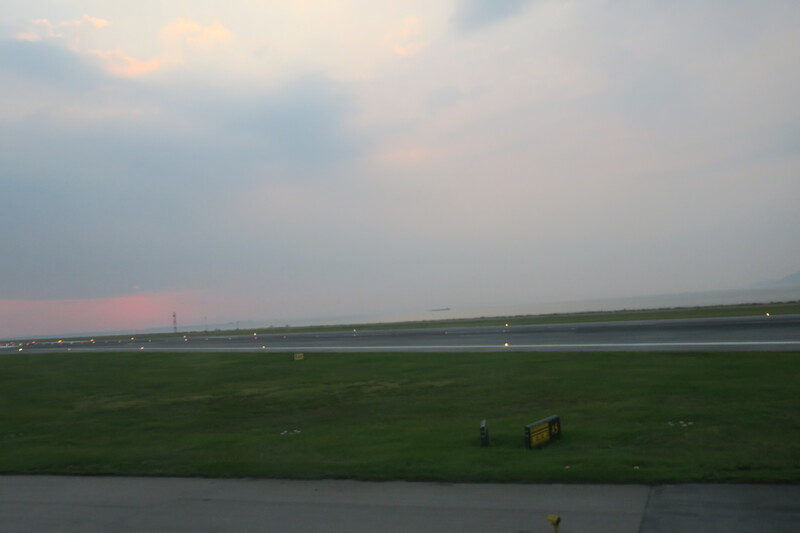 It’s only enhanced on the A350, fortunately. 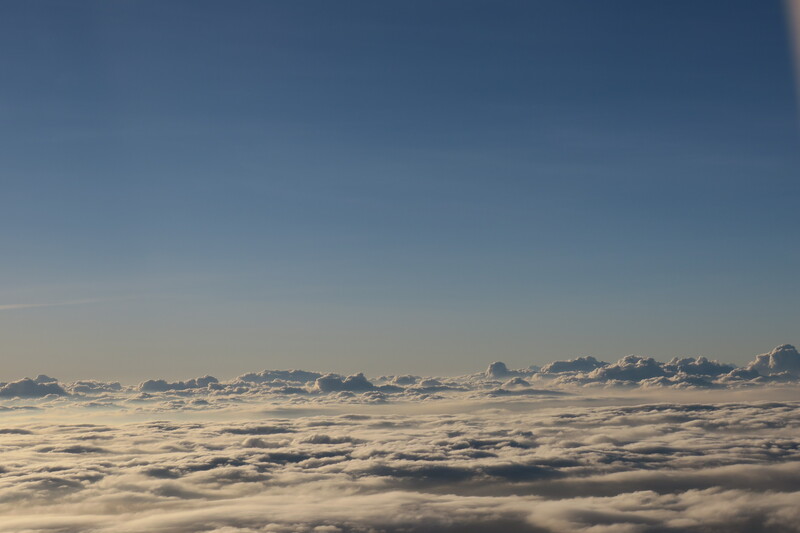 I looked out where the sun was just starting to set. 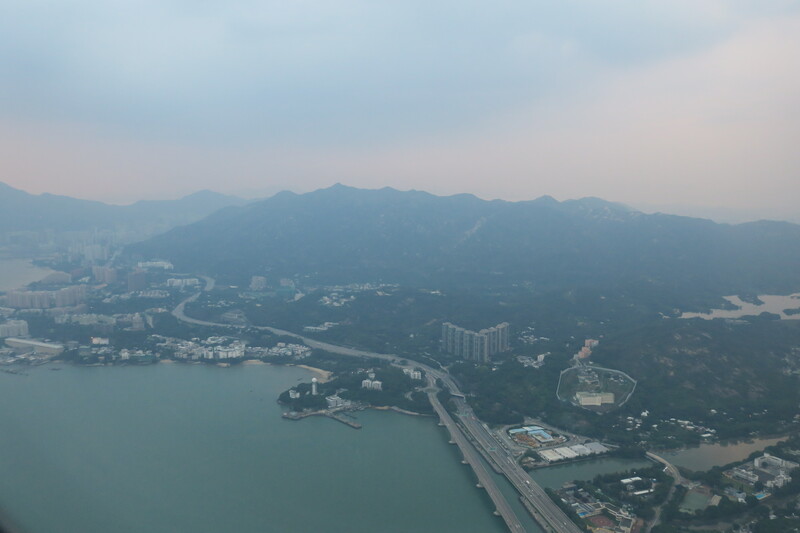 While it looked overcast in Hong Kong, up here it certainly was a beautiful day. 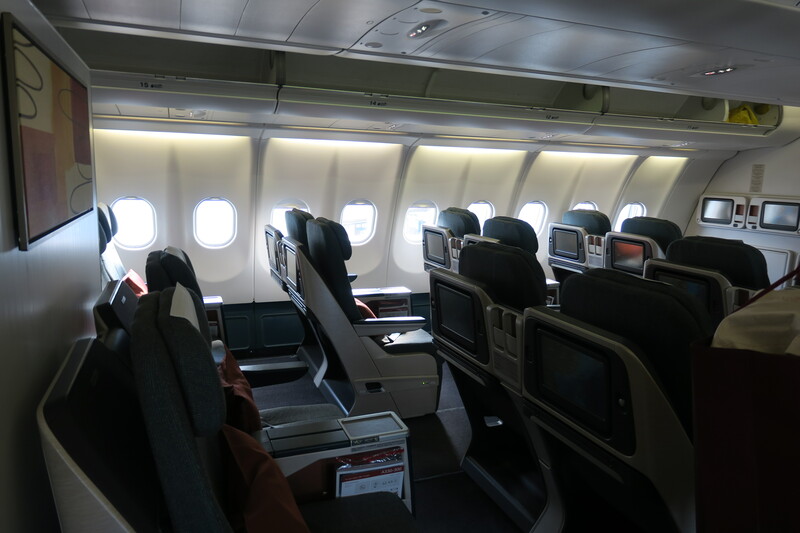 I took a final cabin picture – I’m still not sure if I’d feel claustrophobic on a long flight, but I started to kind of warm to how cosy the cabin was and how exclusive it felt. 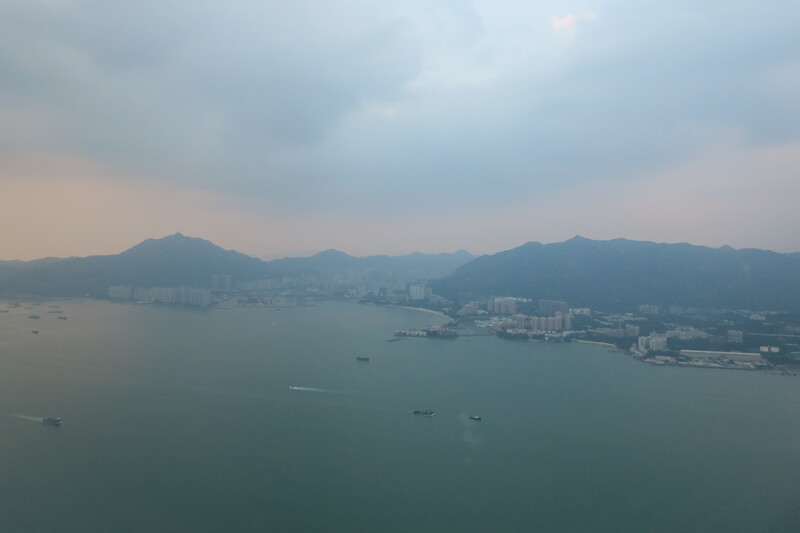 The views got better as we descended into Hong Kong. 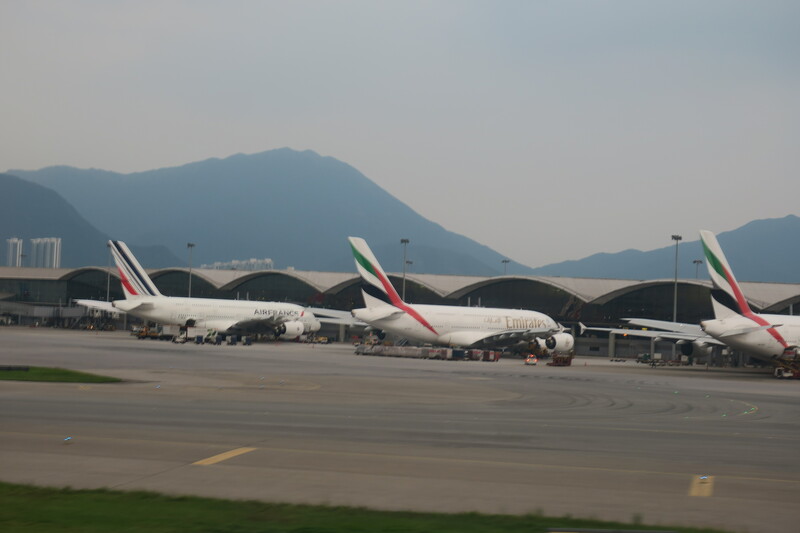 The captain thanked us for flying Cathay Pacific and said that our gate was incredibly close to the immigration area, but would take a while to taxi to. 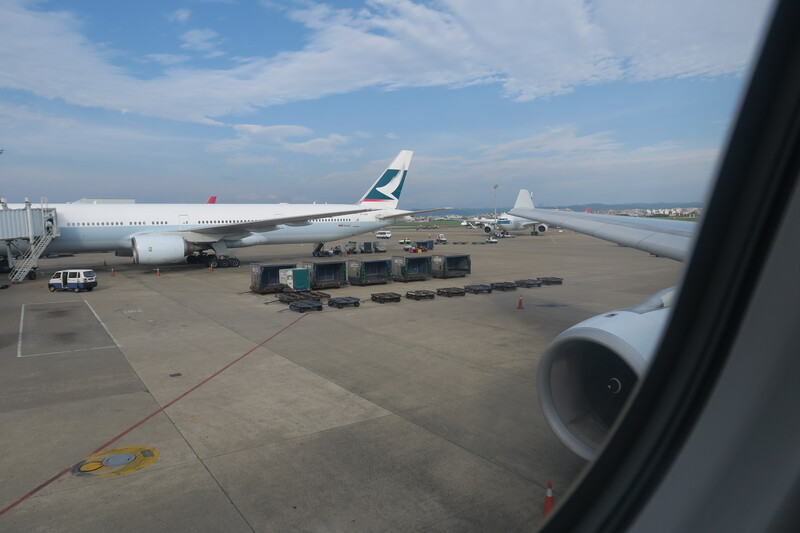 That wasn’t an issue with me – while this is my least favourite Cathay Pacific business class product, it was nice to be spending a little more time in business class for the last time in 2016. 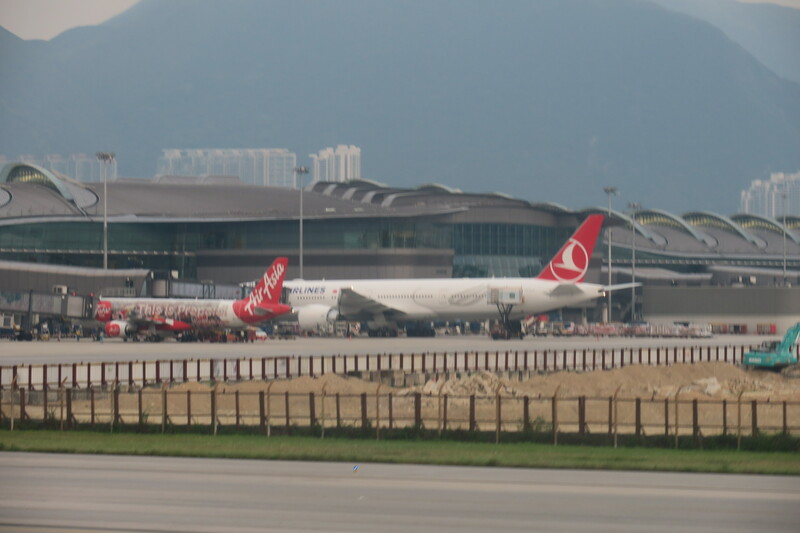 We passed the midfield concourse, where we passed a Turkish Airlines 777-300ER. 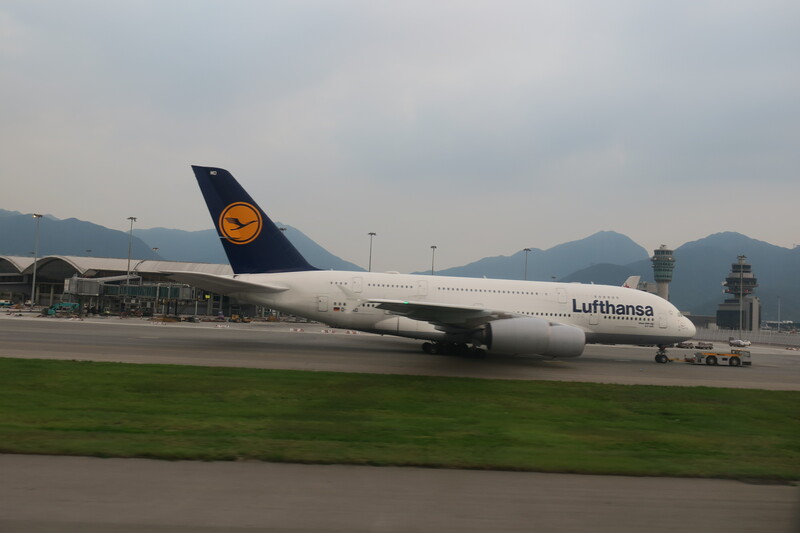 We also passed a Lufthansa A380 which I’m excited to be on in February. 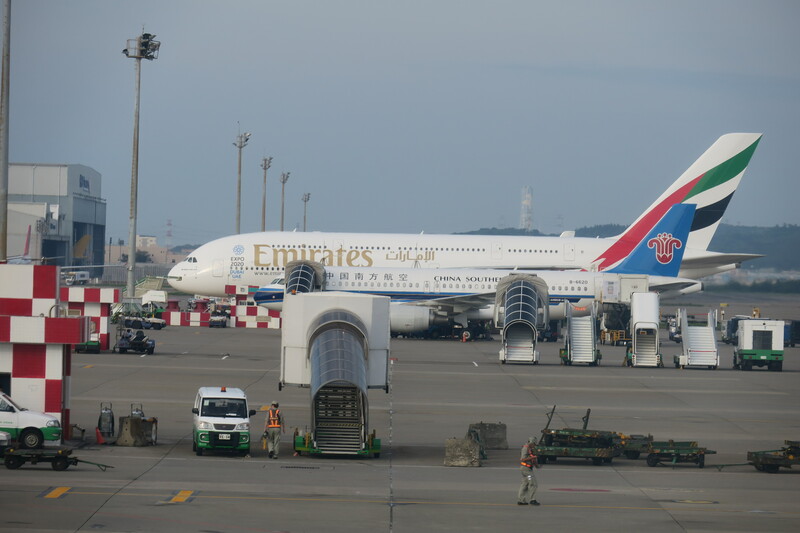 Speaking of A380s, we also passed a couple more, including two Emirates A380s and an Air France A380. 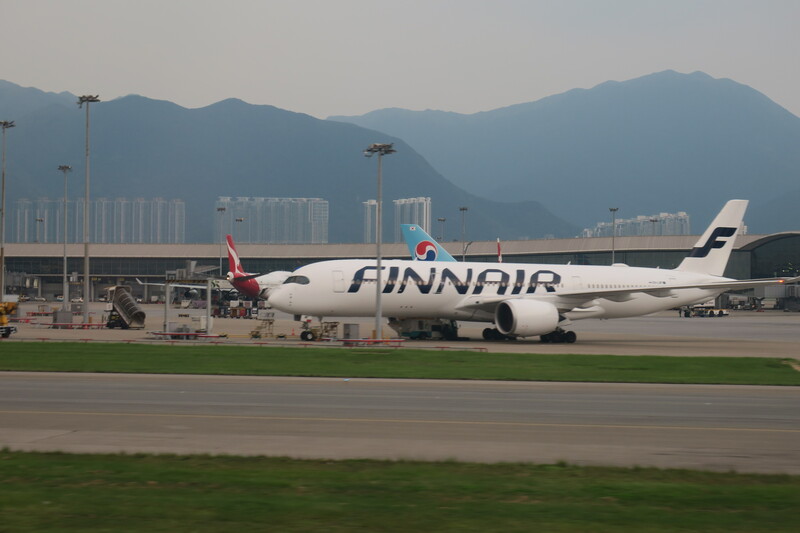 We also passed a Finnair A350 on the way to our gate, which I’d really like to be on (they have incredibly attractive fares, and seemingly incredible service). 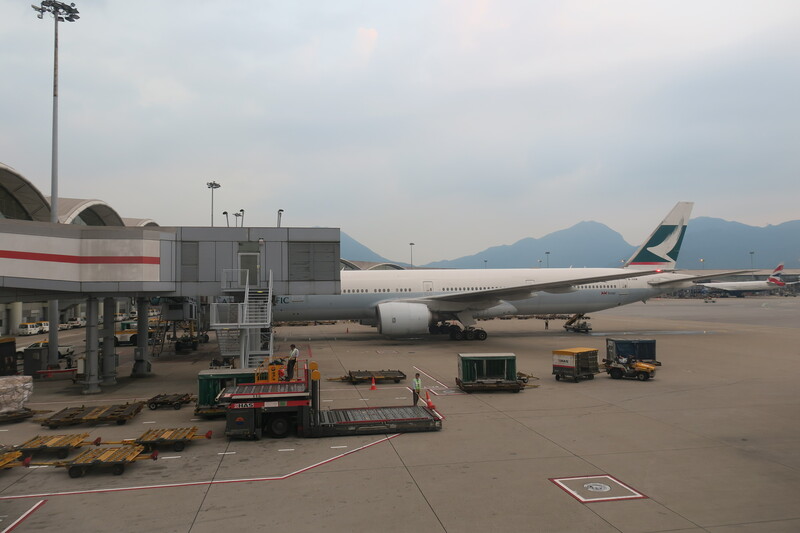 We finally parked next to another Cathay Pacific 777-300 at gate 18. 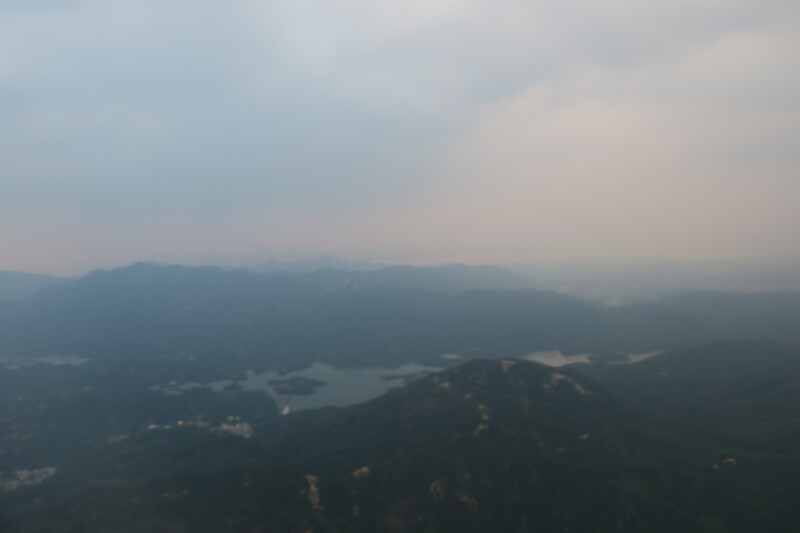 I appreciated that one of the flight attendants made sure I had my camera with me on the way out – she actually sounded concerned. Not that I’d make that mistake at this stage of the blog, but I certainly appreciated that the crew cared. 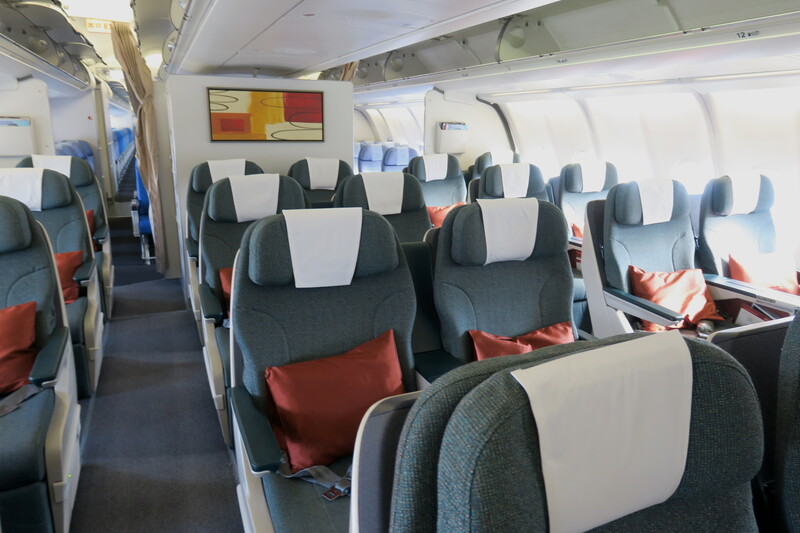 While Cathay Pacific’s new regional A330s don’t really speak that well for the award availability that they have, it’s nice that you get a nice, exclusive cabin. That said, it doesn’t seem like a very good setup for the flight attendants – at least we lucked out with flight attendants that actually cared about the passengers. 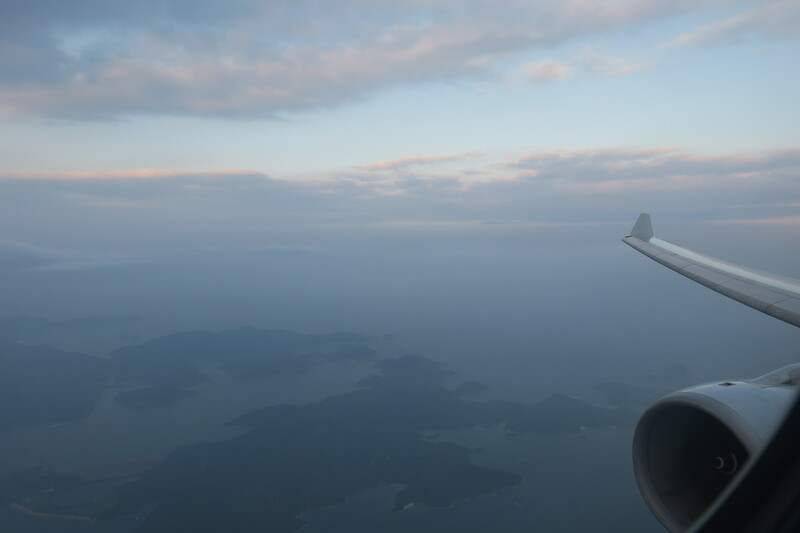 While the general perception of Cathay Pacific flight attendants is that they’re starting to get bitchier and colder, this wasn’t true of most of the flights I’ve had on them this year, this flight being no exception. 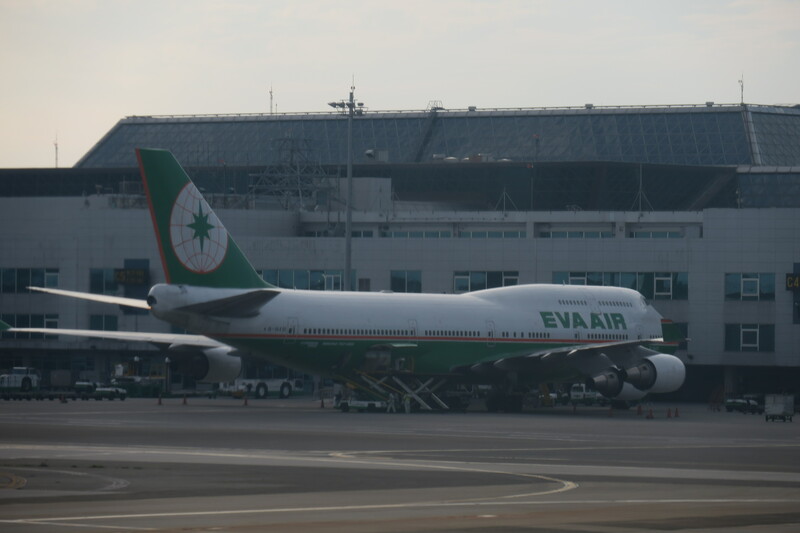 I’m excited to see that Cathay Pacific is starting to rebound from all the bad press that they got from SCMP, and their rebranding is really doing wonders. 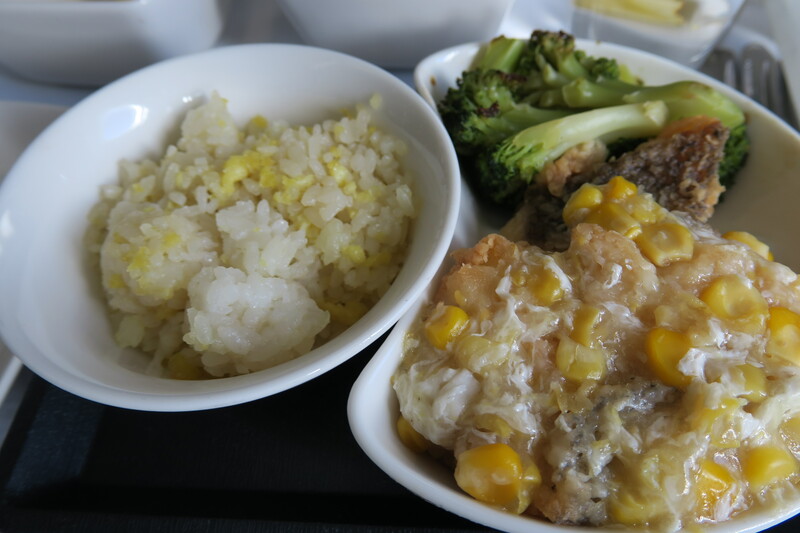 As for the food, I’ll take this meal as a one-off, as it was by far the worst meal I’ve had in any class on Cathay Pacific this year (though, in the long run, I guess I’ve had worse). 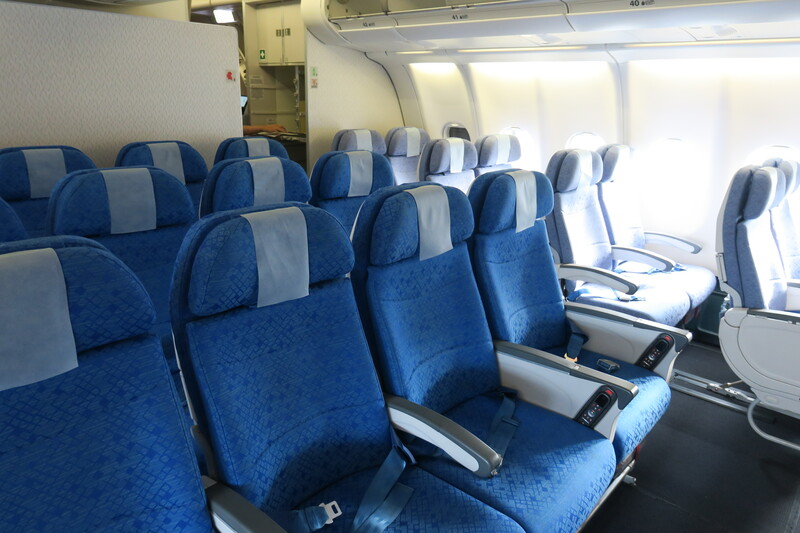 ‹ PreviousCathay Pacific Premium Economy: How Has It Changed?